In the book of the prophet Isaiah, God teaches mankind, “my thoughts are not your thoughts, nor are your ways my ways… For as the heavens are higher than the earth, so are my ways higher than your ways, my thoughts higher than your thoughts.” (Isa 55:8-9 NABRE). The words of God in this passage, spoken through the Prophet, remind us that no matter how hard we try to come to a full knowledge and understanding of the ways of God in this life, we will still fall short. Modern skeptics argue against faith and the truth of Scripture with intelligent, well-researched, and well-structured arguments based on seeming inconsistencies found within the supposedly-inerrant Scriptures. The “Method B” approach of the modern, historical-critical skeptic zooms into snippets of Scripture and focuses on the origins, historical settings, and truths surrounding the text to understand it from a scientific viewpoint. Because of such a read, and forgetting that “[God’s] thoughts are higher than [our] thoughts,” a skeptic using this approach is unable to explain seeming contradictions scattered through the entire Canon of Scripture, or singular events or stories that stand in contrast to the full, revealed truth of God’s nature and essence. Particularly in the Old Testament, there are many different types of contradictions noted by modern scholars: the nature of God, the nature of good and evil, and the nature of the afterlife. One of the major contradictions noted in the Old Testament by modern scholars and skeptics is the presence of so much evil directly or indirectly caused by, or seemingly ordered or permitted by, a God who is otherwise presented as all-loving, all-knowing, and fully-benevolent. This paper will outline some of the modern (Method B) challenges to the inerrancy of Scripture, specifically stemming from this “problem of evil,” outline some of the traditional arguments against this concern from the Church’s history and tradition (Method A), and explore some of the ways that these arguments can be synthesized using a new method that can help better serve a modern audience. It will also explore some of the principles one must understand and address to prepare an appropriate response for the modern Method B skeptic. To overcome these critical challenges, today’s Christian apologist cannot expect to rely solely upon ancient arguments of faith, predominantly written/provided by the Doctors of the Church and passed along in the Church’s Tradition. These arguments, referred to as Method A exegesis, are useful in explaining or building upon an understanding of elements of Scripture for a person who already has the gift of faith. However, for a skeptic, they typically lead only to more questions or objections and do not carry much credibility in modern argument devoid of faith. Pope Benedict XVI, when he was still Cardinal Joseph Ratzinger, proposed a new method of exegesis, Method C, which marries the strengths of both Method A (insights from the legacy and inherited tradition of the church) and Method B (a careful, historically-informed reading of the text). When proposing his Method C, Benedict layed out a vision in which a faithful scholar could incorporate Method B questions, interpretations, and approaches, insofar as they don’t conflict with the depth of knowledge and insight from the Church’s treasury of tradition (Method A), and bring the two together into a new approach, rather than relying solely upon one or the other. Similar to how Benedict saw the opportunity for the old and new forms of the liturgy to be “mutually enriching,”1 he also imagined an approach to Biblical scholarship by which tradition and modern exegesis could mutually enrich each other in his Method C.
As noted, one major objection raised by modern skeptics is the presence of so much evil in the creation of a good God. In God is Not Great, the New York Times bestseller by popular skeptic Christopher Hitchens, he “presents his readers with everything from ‘demented pronouncements’ in Scripture to the more serious ‘atrocities’ committed by God and the people of God.”2 In Benedict’s September 2006 address at Regensburg, he asserted that “violence is incompatible with the nature of God.”3 One hundred Muslim leaders responded to his assertion, referring to God drowning Pharaoh and his armies in the waters of the Red Sea, and asking the question, “When God drowned Pharaoh, was He going against his own Nature?”4 It is a very valid question, posed by educated men in the modern world, of how a good God can permit or enact some of the evil events found in Scripture. Some of the instances of evil in the Old Testament that Matthew J. Ramage explicitly calls out in Dark Passages of the Bible, Engaging Scripture with Benedict XVI & Thomas Aquinas, include God destroying everything but Noah’s family and the animals with them in the ark in Genesis 7, the killing of the first-born throughout the land of Egypt (the Passover) in Exodus 12, the destruction and conquest of Canaan in Deuteronomy 20, and the killing of every man, woman, and child in those conquests in Deuteronomy 2.5 These certainly are difficult texts to explain. Before our discussion turns specifically to answering for some of these texts, it is important to explore two overarching concepts in Biblical exegesis: Scripture’s apparent development, and the existence of apparent contradictions in Scripture. These “articles” of which Aquinas speaks are the subjects that the faithful know or believe. While they increased or were known about more explicitly over time, the substantive truth of God and faith did not change over time. Why would God reveal these subjects, even these truths about Himself, over time? One reasonable explanation is that it took time and discernment for man to come to understand, grasp, and assimilate these truths. Much of the Old Testament, in fact, is a story of the people of Israel learning something from God, accepting it for a time, then turning back away from God until they learned through trial and error that society, culture, and life were better when they were living in the ways that had been revealed to them. Aquinas says, “Man acquires a share of this learning, not indeed all at once, but little by little, according to the mode of his nature.”9 Aquinas provides a helpful framework for combining the unity of Scripture stressed by Method A, while acknowledging and integrating the apparent development within Scripture often noted by Method B. With a fuller understanding of how to deal with the development of Scripture and of apparent contradictions therein, our attention can now turn to some of the specific “dark passages” noted earlier, and others, reflecting the nature of good and evil presented in the Bible. A modern scholar using a Method B historical-critical approach would look at each piece of text independently, seeking answers from the historical context as to what it meant that God struck down all the firstborn of Egypt, or that God purposefully gave the Israelites statutes that weren’t good, or caused them to offer their own children as sacrifice. Someone using Method A exegesis would look elsewhere in the Bible to find explanations for these passages, to back up their belief that God would not do such evil things. Before one tries to build a Method C approach to these Scriptures, it’s helpful to turn to one additional sequence of Old Testament events: the various ways that the Old Testament authors tried to understand the “hardening of the heart” of Pharaoh. Pharaoh’s hardened heart – expressed through his reactions to Moses and the plagues that befell Egypt, and how he chose to continue to respond to those various events, provides interesting insight into the Old Testament authors’ own wrestling with God’s causality of such events, and even God’s causality of Pharaoh’s hardened heart. As Ramage calls out in Dark Passages, “Although the majority of the time Exodus narrates that ‘the Lord hardened Pharaoh’s heart’ (Ex 9:12) or even reports God’s words, ‘I will harden his heart,’… in other places it states that ‘Pharaoh hardened his [own] heart’ (Ex 8:32), or simply that ‘Pharaoh’s heart was hardened.’ (Ex 7:13)14 This is a fantastic way to illustrate to a Method B exegete, via the development within the text describing the sequence of events, how Aquinas’s concept of the substance being the same even though the writers’ understanding continued to develop, is at play as it relates to how much God’s own action or causality played into these events. It then becomes relatively easy to turn the conversation toward how Israel and its Old Testament writers continued to grow in their understanding of how active God was or wasn’t in causing some of these evil events. The point of the text is its sum, not the individual parts. If, as Ramage points out, “most Method B scholars concur that the Pentateuch as we have it today is the product of many different authors writing over many centuries,”15 then one could also point out that all the various authors and redactors who eventually brought us the text as we have it today could have removed the discrepancies if they thought that it was important. The fact that they did not illuminates that the text is intended to impart a different lesson – perhaps not a definitive teaching on God’s causing (or not causing) evil, but instead to teach some other truth about God, or God’s intent for his relationship with man. These passages express a sentiment that also shined through in the earlier citation from Ezekiel 20, in which the author assumed that God willed the evils that befell the Israelites on their journey, as a response for their turning from his ways. Now, in Deuteronomy, there is an assumption that God’s active will of these events is the cause of them. Again, one sees the earlier assumptions of the Old Testament writers, not yet fully developed through the ongoing revelation of God to His people, perhaps misattributing the cause of some of these historical events. To help explain these, it is helpful to look at another area of development through the Old Testament, the development of the “accuser,” the earliest and developing form of Satan through Scripture. Some of Method B comes into play as one considers the development, over time, of the character of an “accuser” who initially stands pointing out the cause of evil events, into a character who openly antagonizes Biblical characters like Job, and then into a character who is in opposition to God. If Method A and Method B exegetes can agree upon the development of another key Old Testament “character” like the one who developed, in the fullness of revelation, into Satan, then a Method C synthesis can point back to the development of Old Testament authors’ understanding of the causality of evil events. Whereas in one period of Old Testament writings it may have been assumed that God willed or caused events like those in Deuteronomy relating the conquest of the promised land, as the divine pedagogy revealed more of God’s fullness to man over time, authors were subsequently able to hone their understanding of what God may have actively willed versus what God may have simply permitted, allowing room for man’s free will. Submitted October 3, 2017, for the course “Introduction to Scripture”, Instructor: Dr. Matthew Ramage. 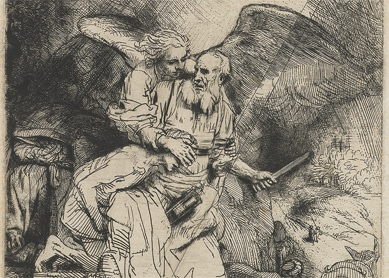 Image: Rembrandt van Rijn, Abraham’s Sacrifice. Etching and drypoint on paper, 1655. Matthew J. Ramage, Dark Passages of the Bible: Engaging Scripture with Benedict XVI & Thomas Aquinas (Washington, D.C.: The Catholic University of America Press, 2013), 179. Thomas Aquinas, Summa Theologica, II-II, q.1, a.7. Thomas Aquinas, Summa Theologica, II-II, q.174, a.1. Paul Synave and Pierre Benoit, Prophecy and Inspiration: A Commentary on the Summa Theologica II-II, Questions 171-178 (New York: Desclee Co., 1961), 88. John Henry Newman, On the Inspiration of Scripture, edited by J. Derek Holmes and Robert Murray (Washington, D.C.: Corpus Books, 1967), 10.